Inside: The Black Archer meets The Savage! 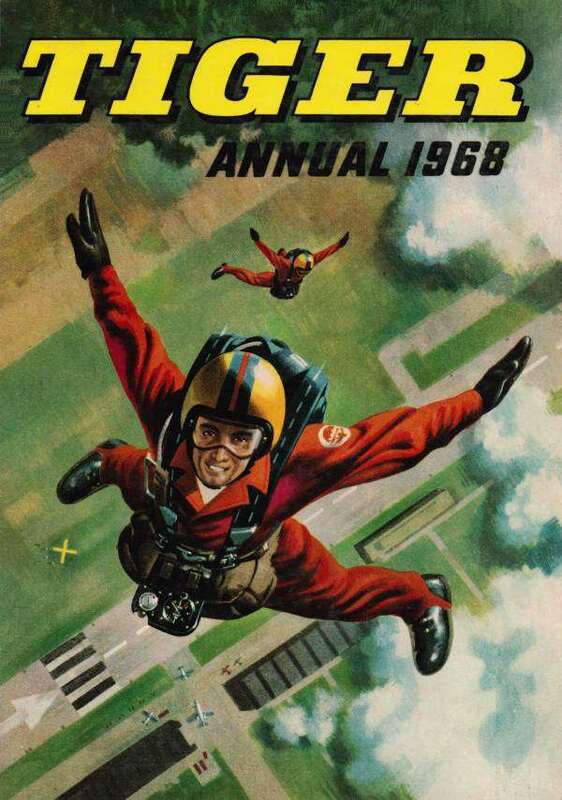 Here is a truly great comic annual of the 1960's. 160 pages jam-packed, with great picture strip and stories and features which include, Roy Of The Rovers, Typhoon Tracy, Skid Solo, Johnny Cougar, Jet Ace Logan and Olac The Gladiator. I was an avid reader of Hurricane comic before it joined Tiger. So in this book you have the forces of Roy of the Roves from Tiger and Typhoon Tracy from Hurricane to make this a fantastic annual. And it was only 9/6. A giant book for a twelve year old at a small price. The 1960's was by far the best decade for Tiger comic and Tiger annuals. This is my favourite, with great stories and features. Nice one on flying saucers, debating could they be time machines. Another fab article on, Weird Weapons of World War II. And there is always great sporting features on, football, cricket, parachuting and motor cycling. Get a chance, read it - you will not be disappointed. The Black Archer Meets The Savage. By day, Clem Macey is a television reporter for Delago City News, but when there is trouble Clem can, by thought, turn himself into, The Black Archer. Can Clem defeat the three crooks as they break into City Hall to rob the Art Exhibition. Revolt on Prison Planet - A Jet-Ace Logan story. Jet-Ace with his faithful navigator Plumduff Charteris, are on a convict run, taking the villain, Kronig to the prison planet. But as they leave a distress message is received from the planet stating they are being attacked by outlaw ships. This starts a great adventure as Jet-Ace and Plumduff do battle with the outlaw ships, losing, they have to take salvage on a planet of apes. Can they escape from the planet with their lives. Johnny Cougar from the plains of the United States. This famous Red-Indian wrestler travels the world, fighting the most bizarre opponents, which leads to some great adventures.